The complexity of the twenty-first century threat landscape contrasts markedly with the bilateral nuclear bargaining context envisioned by classical deterrence theory. Nuclear and conventional arsenals continue to develop alongside anti-satellite programs, autonomous robotics or drones, cyber operations, biotechnology, and other innovations barely imagined in the early nuclear age. 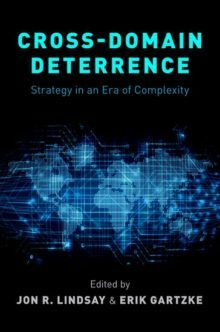 The concept of cross-domain deterrence (CDD) emerged near the end of the George W. Bush administration as policymakers and commanders confronted emerging threats to vital military systems in space and cyberspace. The Pentagon now recognizes five operational environments or so-called domains (land, sea, air, space, and cyberspace), and CDD poses serious problems in practice. In Cross-Domain Deterrence, Erik Gartzke and Jon R. Lindsay assess the theoretical relevance of CDD for the field of International Relations. As a general concept, CDD posits that how actors choose to deter affects the quality of the deterrence they achieve. Contributors to this volume include senior and junior scholars and national security practitioners. Their chapters probe the analytical utility of CDD by examining how differences across, and combinations of, different military and non-military instruments can affect choices and outcomes in coercive policy in historical and contemporary cases.